Whew! I'm getting this in just under the wire : ) I made this for this week's All That Scaps Challenge which was to make a green St. Patrick's Day card! I used this adorable Sugarplums Party Emma image and some dp from the DCWV Flower Shower Spring Matstack. I found the rhinestone shamrock at Michael's by Recollections and computer generated the sentiment. I'm missing American Idol so I'm going to keep this short and sweet : ) Thank you so much for stopping by and have a fabulous St. Patty's Day!!! Aw!! This is adorable Kerri!! I just love your coloring of the sweet image!! 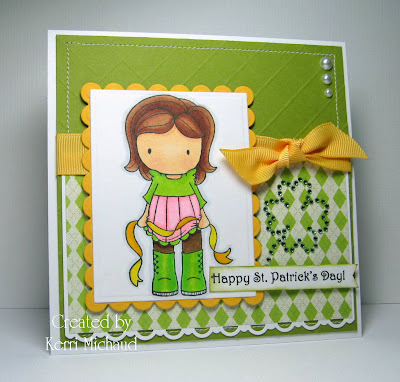 The punched border, paper and shamrock are perfect!! Gorgeous St. Patricks Day Creation! AWWW Kerri what a darling St Patrick's Day card..LOVE your papers, bling, and scallops...Beautiful GF! Just adorable! Love the bling! infact lets make that three lol.. This is a fabulous little St. Patrick's day card. I love the added clover on there, and the different sized pearls. Nicely done! This is so cute! Love your coloring, the scored section and the rhinestone shamrock! Adorable. Beautiful coloring and such a sweet card. The challenge was to make a green St. Patrick's Day card? Is that really a challenge? What other color would you make a St. Patrick's Day card? - LOL Love that little shamrock...looks perfectly Irish on that argyle. So sweet! Love, love your idea with a shamrock!